Measles (rubeola) is a highly contagious vaccine-preventable disease caused by the measles virus—a virus of the Paramyxoviridae family. The illness typically begins with fever, runny nose, cough, and pathognomonic enanthem (Koplik spots) followed by a characteristic erythematous, maculopapular rash. 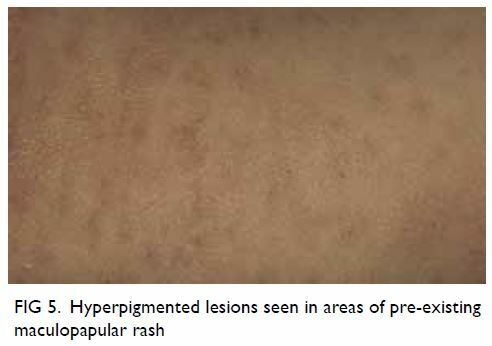 The rash classically begins on the face and becomes more confluent as it spreads cephalocaudally. Laboratory confirmation of measles virus infection can be based on a positive serological test for measles-specific immunoglobulin M antibody, a four-fold or greater increase in measles-specific immunoglobulin G between acute and convalescent sera, isolation of measles virus in culture, or detection of measles virus ribonucleic acid by reverse transcriptase-polymerase chain reaction. Complications occur in 10% to 40% of patients, and treatment is mainly symptomatic. Bacterial superinfections, if present, should be properly treated with antibiotics. To eradicate measles, universal childhood immunisation and vaccination of all susceptible individuals with measles vaccine would be ideal. In developed countries, routine immunisation with measles-containing vaccine is recommended, with the first and second doses at ages 12 to 15 months and 4 to 6 years, respectively. The World Health Organization recommends that the first and second doses of measles-containing vaccine be given at ages 9 months and 15 to 18 months, respectively, in countries with high rates of measles transmission. Measles (rubeola) is an extremely contagious, acute febrile viral illness. The illness typically begins with fever, runny nose, cough, and pathognomonic enanthem (Koplik spots) followed by a characteristic erythematous, maculopapular rash. Prior to the introduction of measles vaccine, measles was responsible for more than 2 million deaths worldwide annually.1 2 3 The incidence has declined dramatically over the past 20 years, and measles-associated mortality had decreased to slightly more than 100 000 by 2015 thanks to the increasingly widespread use of attenuated measles vaccines.2 Nevertheless, as of today, measles remains an important cause of morbidity and mortality in young children globally, especially in developing countries.4 As such, physicians should familiarise themselves with this disease and be able to recognise it early so that isolation measures can be promptly instituted to prevent its spread. This article provides an update on current knowledge about measles and outlines an approach to its evaluation and management. A PubMed search was conducted in May 2018 using Clinical Queries with the key terms “Measles” and “Rubeola”. The search strategy included meta-analyses, randomised controlled trials, clinical trials, observational studies, and reviews. Discussion is based on, but not limited to, the search results. Prior to the introduction of the measles vaccine, more than 90% of children contracted measles by age 15 years.6 14 Since the introduction of the vaccine, the disease has become increasing rare in North America and many developed countries.11 Globally, the number of reported cases of measles decreased from 146 cases per million in 2000 to 36 cases per million in 2015.14 Most reported cases in 2015 were from Africa. In decreasing order of frequency, the Western Pacific and South-East Asia regions had the next highest frequencies of measles cases.2 In the US, the annual incidence of measles was 0.08 and 2.06 per million population in 2001 and 2015, respectively.15 Currently, measles cases in developed countries are primarily “imported” from countries where measles is endemic and occur almost exclusively in unvaccinated or incompletely vaccinated individuals.11 14 Outbreaks of measles may occur because of immunity gaps in spite of high overall vaccine coverage.2 In developed countries, vaccine negligence or refusal is problematic and accounts for such outbreaks.16 17 18 19 In March 2018, there was an outbreak of measles in Okinawa, Japan. The measles virus is believed to have entered Japan via travellers in Taiwan. During the acute infection and for several weeks to months afterwards, humoral and cellular responses to new antigens are impaired. This can persist for weeks to months, rendering the individual more susceptible to infections caused by other pathogens.5 21 Immune amnesia results from replacement of the established memory cell repertoire by measles virus-specific lymphocytes.2 Delayed-type hypersensitivity is also decreased. 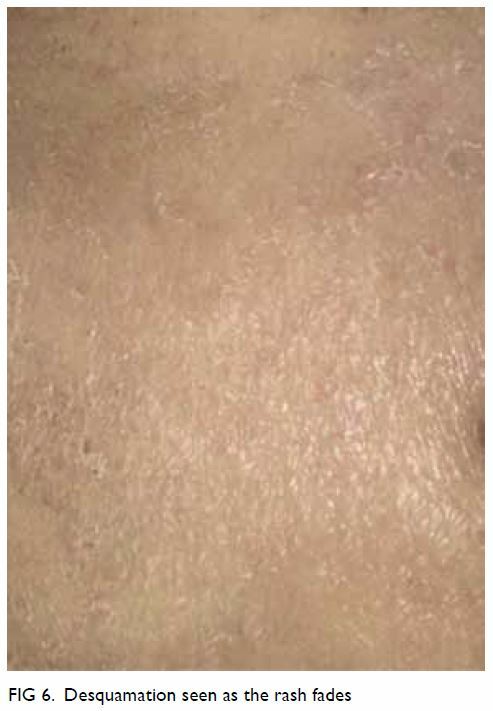 Typically, morbilliform exanthem appears 3 to 4 days after the onset of fever and peaks with the appearance of exanthem,11 which consists of blanching, erythema, macules, and papules that classically begin on the face, around the hairline, on the sides of neck, and behind the ears.11 25 The rash becomes more confluent as it spreads downwards to the trunk and extremities (Figs 2 3 4).1 9 The lesions are more tense around the shoulders.7 The palms of the hands and soles of the feet are rarely affected.26 The lesions may be petechial or ecchymotic.7 The rash lasts for 5 to 10 days and fades in the same directional pattern in which it appears.7 Brownish discolouration (especially in patients of Caucasian descent; Fig 5) with fine desquamation (especially in malnourished patients; Fig 6) sometimes occurs as the rash fades.2 23 Fever usually subsides as the rash fades.12 Persistence of fever usually indicates complications. Neurological complications include febrile seizures, primary measles encephalitis, acute post-infectious encephalomyelitis, measles inclusion body encephalitis, and subacute sclerosing panencephalitis.12 31 32 33 Approximately one in 1000 patients with measles develop primary measles encephalitis, typically on day 5 of the rash (range: 1-14 days). That condition is fatal in approximately 10% of cases. Acute post-infectious encephalomyelitis is an autoimmune demyelinating disease that occurs approximately one in 1000 patients with measles. 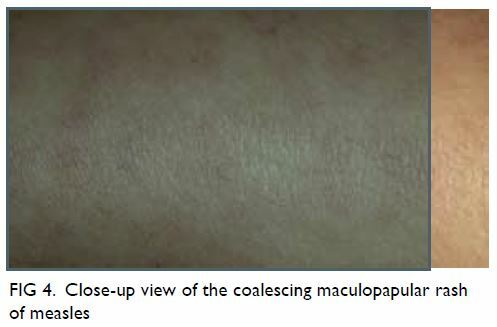 The condition typically manifests during the recovery phase, within 2 weeks of the rash. Measles inclusion body encephalitis occurs mainly in patients with impaired cellular immunity within months of the measles infection. That condition may cause progressive brain damage and has a high mortality rate. Subacute sclerosing panencephalitis is a fatal, progressive degenerative central nervous system disease that usually presents 5 to 10 years after the measles virus infection. Measles should be suspected in the presence of all the following: fever ≥101°F (38.3°C); erythematous maculopapular (non-vesicular) rash spreading cephalocaudally from the face downwards and lasting 3 or more days; and at least one of the three “C”s: coryza, cough, or conjunctivitis.11 Suspicion should be particularly strong in individuals with no measles immunity if there is a history of exposure to measles, travel to endemic areas (eg, Africa, Western Pacific, and South-East Asia regions), or during an outbreak of measles. 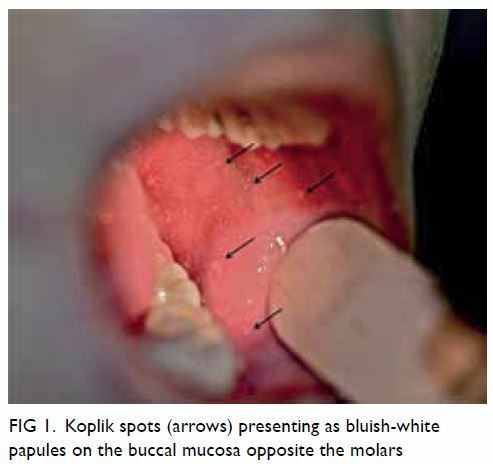 Koplik spots, if present, are pathognomonic. Diagnosis can be difficult in areas with low measles incidence. Differential diagnosis includes rubella, roseola, varicella, erythema infectiosum, hand-foot-mouth disease, drug eruptions, scarlet fever, toxic shock syndrome, infectious mononucleosis, Rocky Mountain spotted fever, meningococcaemia, Henoch-Schönlein purpura, systemic lupus erythematosus, Kawasaki disease, and serum sickness. There is no specific antiviral therapy for patients with measles. Although in vitro studies have shown that the measles virus is susceptible to ribavirin, and preliminary studies have shown the efficacy of ribavirin in treatment of patients with measles,35 36 no randomised controlled studies have assessed its clinical efficacy and safety profile. Hopefully, well-designed, large-scale, randomised, double-blind, placebo-controlled trials will provide more information on the efficacy and safety profile of ribavirin in children with measles in the future. Until such information is available, ribavirin cannot be routinely recommended. Measles is highly contagious and can lead to serious and potentially fatal consequences among individuals who have not been vaccinated. To eliminate measles from a population, universal childhood immunisation and vaccination of all susceptible individuals with measles vaccine is recommended. Generally, vaccination against measles is effective and safe. Outbreaks of measles may occur because of immunity gaps despite high overall vaccine coverage. In developed countries, vaccine refusal is problematic and accounts for such outbreaks. All authors have made substantial contributions to the concept or design of this study; acquisition of data; analysis or interpretation of data; drafting of the article; and critical revision for important intellectual content. As an editor of the journal, KL Hon was not involved in the peer review of the article. All authors have disclosed no conflicts of interest. All authors had full access to the data, contributed to the study, approved the final version for publication, and take responsibility for its accuracy and integrity. 4. Kondamudi NP, Whitten RA. Measles. Available from: https://www.ncbi.nlm.nih.gov/books/NBK448068/. Accessed 15 May 2018. 14. Gans H, Maldonado YA. 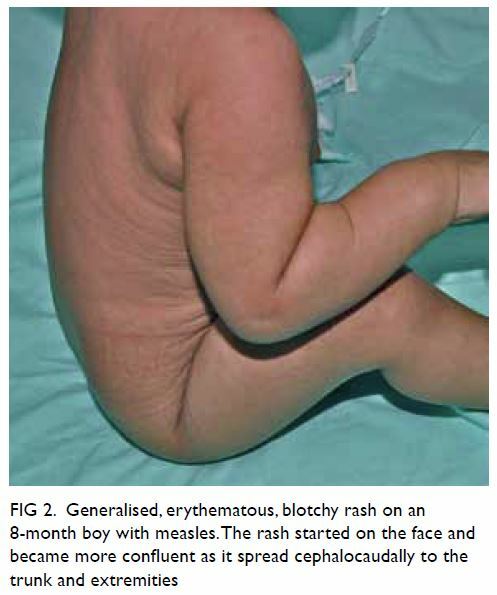 Measles: epidemiology and transmission. Available from: https://www.uptodate.com/contents/measles-epidemiology-and-transmission. Accessed 25 May 2018. 16. Zipprich J, Winter K, Hacker J, et al. Measles outbreak—California, December 2014-February 2015. 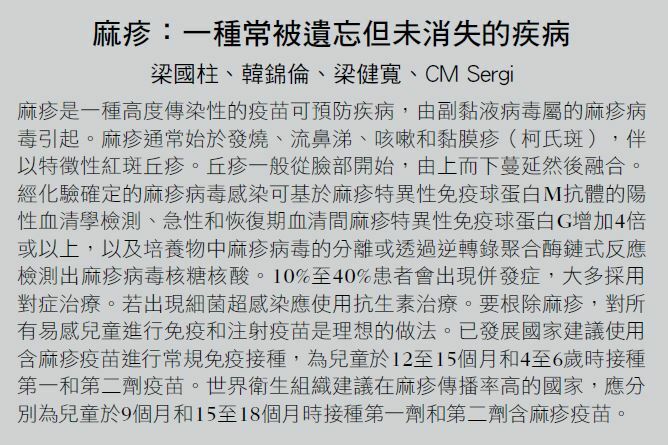 MMWR Morb Mortal Wkly Rep 2015;64:153-4. 22. Adu FD, Adeniji JA. Measles antibodies in the breast milk of nursing mothers. Afr J Med Med Sci 1995;24:385-8. 23. Gans H, Maldonado YA. Measles: clinical manifestations, diagnosis, treatment, and prevention. Available from: https://www.uptodate.com/contents/measles-clinical-manifestations-diagnosis-treatment-and-prevention. Accessed 25 May 2018. 24. 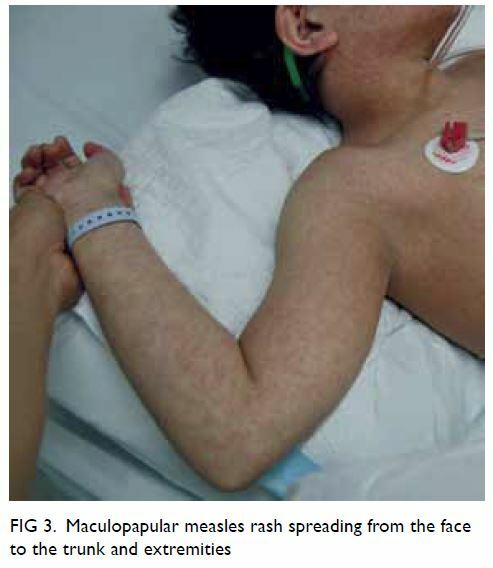 Campos-Outcalt D. Measles: why it’s still a threat. J Fam Pract 2017;66:446-9. 29. Lai WS, Lin YY, Wang CH, Chen HC. Measles: a missed cause of acute tonsillitis. Ear Nose Throat J 2017;96:E54-5. 38. Drutz JE. Measles, mumps, and rubella immunization in infants, children, and adolescents. Available from: https://www.uptodate.com/contents/measles-mumps-and-rubella-immunization-in-infants-children-and-adolescents. Accessed 25 May 2018. 39. McLean HQ, Fiebelkorn AP, Temte JL, Wallace GS; Centers for Disease Control and Prevention. Prevention of measles, rubella, congenital rubella syndrome, and mumps, 2013: summary recommendations of the Advisory Committee on Immunization Practices (ACIP). MMWR Recomm Rep 2013;62:1-34. 45. US Centers for Disease Control and Prevention. Guidelines for environmental infection control in health-care facilities. Available from: https://www.cdc.gov/infectioncontrol/pdf/guidelines/environmental-guidelines.pdf. Accessed 20 Jul 2018. 46. US New Jersey Department of Health. Vaccine Preventable Disease Program. Measles Exposure. January 2015. Available from: https://www.state.nj.us/health/cd/documents/topics/measles/measles_exposures_guidance_01_2015.pdf. Accessed 20 Jul 2018.